Supplement Required: 15%. Instead they paid the $250,000 horses of racing age nomination fee to make him Breeders' Cup elibigle. 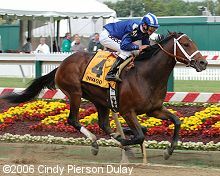 Note: 2005 Uruguayan Triple Crown Winner and Horse of the Year has only lost once in his career and that was in the 2006 UAE Derby to Discreet Cat. Since coming to the US, he has won the Pimlico Special, Suburban, Whitney Handicaps, and Breeders' Cup Classic.